An earlier name for the protein that is still widely used, ataxia-telangiectasia mutated, reflected that the disorder ataxia-telangiectasia is caused by mutations of ATM. Ataxia telangiectasia (AT) is a rare human disease characterized by cerebellar degeneration, extreme cellular sensitivity to radiation and a predisposition to cancer. All AT patients contain mutations in the ATM gene (ATM). Most other AT-like disorders are defective in genes encoding the MRN protein complex. One feature of the ATM protein is its rapid increase in kinase activity immediately following double-strand break formation. The phenotypic manifestation of AT is due to the broad range of substrates for the ATM kinase, involving DNA repair, apoptosis, G1/S, intra-S checkpoint and G2/M checkpoints, gene regulation, translation initiation, and telomere maintenance. Therefore, a defect in ATM has severe consequences in repairing certain types of damage to DNA, and cancer may result from improper repair. AT patients have an increased risk for breast cancer that has been ascribed to ATM's interaction and phosphorylation of BRCA1 and its associated proteins following DNA damage. Certain kinds of leukemias and lymphomas, including Mantle cell lymphoma, T-ALL, atypical B cell chronic lymphocytic leukemia, and T-PLL are also associated with ATM defects. ATM functions during meiotic prophase. The wild-type ATM gene is expressed at a 4-fold increased level in human testes compared to somatic cells (such as skin fibroblasts). In both mice and humans, ATM deficiency results in female and male infertility. Deficient ATM expression causes severe meiotic disruption during prophase I. In addition, impaired ATM-mediated DNA double-strand break (DSB) repair has been identified as a likely cause of aging of mouse and human oocytes. Expression of the ATM gene, as well as other key DSB repair genes, declines with age in mouse and human oocytes and this decline is paralleled by an increase of DSBs in primordial follicles. These findings indicate that ATM-mediated homologous recombinational repair is a crucial function of meiosis. ↑ "Diseases that are genetically associated with ATM view/edit references on wikidata". ↑ "Entrez Gene: ATM ataxia telangiectasia mutated (includes complementation groups A, C and D)". 1 2 Lee JH, Paull TT (December 2007). "Activation and regulation of ATM kinase activity in response to DNA double-strand breaks". Oncogene. 26 (56): 7741–8. doi:10.1038/sj.onc.1210872. PMID 18066086. ↑ "Serine-protein kinase ATM - Homo sapiens (Human)". 1 2 3 Lempiäinen H, Halazonetis TD (October 2009). "Emerging common themes in regulation of PIKKs and PI3Ks". EMBO J. 28 (20): 3067–73. doi:10.1038/emboj.2009.281. PMC 2752028 . PMID 19779456. ↑ Huang X, Halicka HD, Darzynkiewicz Z (November 2004). "Detection of histone H2AX phosphorylation on Ser-139 as an indicator of DNA damage (DNA double-strand breaks)". Curr Protoc Cytom. Chapter 7: Unit 7.27. doi:10.1002/0471142956.cy0727s30. ISBN 0-471-14295-6. PMID 18770804. ↑ Canman CE, Lim DS, Cimprich KA, Taya Y, Tamai K, Sakaguchi K, Appella E, Kastan MB, Siliciano JD (September 1998). "Activation of the ATM kinase by ionizing radiation and phosphorylation of p53". Science. 281 (5383): 1677–9. doi:10.1126/science.281.5383.1677. PMID 9733515. 1 2 Morgan, David O. (2007). The cell cycle: Principles of Control. Oxford University Press. ISBN 0-19-920610-4. ↑ Valentin-Vega YA, Maclean KH, Tait-Mulder J, Milasta S, Steeves M, Dorsey FC, Cleveland JL, Green DR, Kastan MB (2012). "Mitochondrial dysfunction in ataxia-telangiectasia". Blood. 119 (6): 1490–500. doi:10.1182/blood-2011-08-373639. PMC 3286212 . PMID 22144182. ↑ Bakkenist CJ, Kastan MB (January 2003). "DNA damage activates ATM through intermolecular autophosphorylation and dimer dissociation". Nature. 421 (6922): 499–506. doi:10.1038/nature01368. PMID 12556884. ↑ Canman CE, Lim DS (December 1998). "The role of ATM in DNA damage responses and cancer". Oncogene. 17 (25): 3301–8. doi:10.1038/sj.onc.1202577. PMID 9916992. ↑ Banin S, Moyal L, Shieh S, Taya Y, Anderson CW, Chessa L, Smorodinsky NI, Prives C, Reiss Y, Shiloh Y, Ziv Y (September 1998). "Enhanced phosphorylation of p53 by ATM in response to DNA damage". Science. 281 (5383): 1674–7. doi:10.1126/science.281.5383.1674. PMID 9733514. ↑ Kurz EU, Lees-Miller SP (2004). "DNA damage-induced activation of ATM and ATM-dependent signaling pathways". DNA Repair (Amst.). 3 (8–9): 889–900. doi:10.1016/j.dnarep.2004.03.029. PMID 15279774. 1 2 Chen J (September 2000). "Ataxia telangiectasia-related protein is involved in the phosphorylation of BRCA1 following deoxyribonucleic acid damage". Cancer Res. 60 (18): 5037–9. PMID 11016625. ↑ Friedenson B (2007). "The BRCA1/2 pathway prevents hematologic cancers in addition to breast and ovarian cancers". BMC Cancer. 7: 152. doi:10.1186/1471-2407-7-152. PMC 1959234 . PMID 17683622. Lay summary – Scientific Video Site. ↑ Cremona CA, Behrens A (2014). "ATM signalling and cancer". 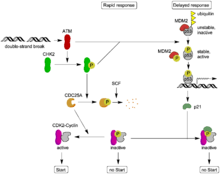 Oncogene. 33 (26): 3351–60. doi:10.1038/onc.2013.275. PMID 23851492. ↑ Mehdipour P, Karami F, Javan F, Mehrazin M (2015). "Linking ATM Promoter Methylation to Cell Cycle Protein Expression in Brain Tumor Patients: Cellular Molecular Triangle Correlation in ATM Territory". Mol. Neurobiol. 52 (1): 293–302. doi:10.1007/s12035-014-8864-9. PMID 25159481. ↑ Delmonico L, Moreira Ados S, Franco MF, Esteves EB, Scherrer L, Gallo CV, do Nascimento CM, Ornellas MH, de Azevedo CM, Alves G (2015). "CDKN2A (p14(ARF)/p16(INK4a)) and ATM promoter methylation in patients with impalpable breast lesions". Hum. Pathol. 46 (10): 1540–7. doi:10.1016/j.humpath.2015.06.016. PMID 26255234. ↑ Vo QN, Kim WJ, Cvitanovic L, Boudreau DA, Ginzinger DG, Brown KD (2004). "The ATM gene is a target for epigenetic silencing in locally advanced breast cancer". Oncogene. 23 (58): 9432–7. doi:10.1038/sj.onc.1208092. PMID 15516988. ↑ Safar AM, Spencer H, Su X, Coffey M, Cooney CA, Ratnasinghe LD, Hutchins LF, Fan CY (2005). "Methylation profiling of archived non-small cell lung cancer: a promising prognostic system". Clin. Cancer Res. 11 (12): 4400–5. doi:10.1158/1078-0432.CCR-04-2378. PMID 15958624. ↑ Bolt J, Vo QN, Kim WJ, McWhorter AJ, Thomson J, Hagensee ME, Friedlander P, Brown KD, Gilbert J (2005). "The ATM/p53 pathway is commonly targeted for inactivation in squamous cell carcinoma of the head and neck (SCCHN) by multiple molecular mechanisms". Oral Oncol. 41 (10): 1013–20. doi:10.1016/j.oraloncology.2005.06.003. PMID 16139561. ↑ Harper JW, Elledge SJ (2007). "The DNA damage response: ten years after". Mol. Cell. 28 (5): 739–45. doi:10.1016/j.molcel.2007.11.015. PMID 18082599. ↑ O'Hagan HM, Mohammad HP, Baylin SB (2008). "Double strand breaks can initiate gene silencing and SIRT1-dependent onset of DNA methylation in an exogenous promoter CpG island". PLoS Genetics. 4 (8): e1000155. doi:10.1371/journal.pgen.1000155. PMC 2491723 . PMID 18704159. ↑ Cuozzo C, Porcellini A, Angrisano T, Morano A, Lee B, Di Pardo A, Messina S, Iuliano R, Fusco A, Santillo MR, Muller MT, Chiariotti L, Gottesman ME, Avvedimento EV (Jul 2007). "DNA damage, homology-directed repair, and DNA methylation". PLoS Genetics. 3 (7): e110. doi:10.1371/journal.pgen.0030110. PMC 1913100 . PMID 17616978. ↑ Hamer G, Kal HB, Westphal CH, Ashley T, de Rooij DG (2004). "Ataxia telangiectasia mutated expression and activation in the testis". Biol. Reprod. 70 (4): 1206–12. doi:10.1095/biolreprod.103.024950. PMID 14681204. ↑ Galetzka D, Weis E, Kohlschmidt N, Bitz O, Stein R, Haaf T (2007). "Expression of somatic DNA repair genes in human testes". J. Cell. Biochem. 100 (5): 1232–9. doi:10.1002/jcb.21113. PMID 17177185. ↑ Barlow C, Liyanage M, Moens PB, Tarsounas M, Nagashima K, Brown K, Rottinghaus S, Jackson SP, Tagle D, Ried T, Wynshaw-Boris A (1998). "Atm deficiency results in severe meiotic disruption as early as leptonema of prophase I". Development. 125 (20): 4007–17. PMID 9735362. 1 2 Titus S, Li F, Stobezki R, Akula K, Unsal E, Jeong K, Dickler M, Robson M, Moy F, Goswami S, Oktay K (2013). "Impairment of BRCA1-related DNA double-strand break repair leads to ovarian aging in mice and humans". Sci Transl Med. 5 (172): 172ra21. doi:10.1126/scitranslmed.3004925. PMID 23408054. 1 2 Chen G, Yuan SS, Liu W, Xu Y, Trujillo K, Song B, Cong F, Goff SP, Wu Y, Arlinghaus R, Baltimore D, Gasser PJ, Park MS, Sung P, Lee EY (April 1999). "Radiation-induced assembly of Rad51 and Rad52 recombination complex requires ATM and c-Abl". J. Biol. Chem. 274 (18): 12748–52. doi:10.1074/jbc.274.18.12748. PMID 10212258. 1 2 Kishi S, Zhou XZ, Ziv Y, Khoo C, Hill DE, Shiloh Y, Lu KP (August 2001). "Telomeric protein Pin2/TRF1 as an important ATM target in response to double strand DNA breaks". J. Biol. Chem. 276 (31): 29282–91. doi:10.1074/jbc.M011534200. PMID 11375976. ↑ Shafman T, Khanna KK, Kedar P, Spring K, Kozlov S, Yen T, Hobson K, Gatei M, Zhang N, Watters D, Egerton M, Shiloh Y, Kharbanda S, Kufe D, Lavin MF (May 1997). "Interaction between ATM protein and c-Abl in response to DNA damage". Nature. 387 (6632): 520–3. doi:10.1038/387520a0. PMID 9168117. 1 2 3 4 5 6 7 Kim ST, Lim DS, Canman CE, Kastan MB (Dec 1999). "Substrate specificities and identification of putative substrates of ATM kinase family members". J. Biol. Chem. 274 (53): 37538–43. doi:10.1074/jbc.274.53.37538. PMID 10608806. 1 2 3 4 Wang Y, Cortez D, Yazdi P, Neff N, Elledge SJ, Qin J (April 2000). "BASC, a super complex of BRCA1-associated proteins involved in the recognition and repair of aberrant DNA structures". Genes Dev. 14 (8): 927–39. doi:10.1101/gad.14.8.927. PMC 316544 . PMID 10783165. ↑ Gatei M, Scott SP, Filippovitch I, Soronika N, Lavin MF, Weber B, Khanna KK (June 2000). "Role for ATM in DNA damage-induced phosphorylation of BRCA1". Cancer Res. 60 (12): 3299–304. PMID 10866324. ↑ Cortez D, Wang Y, Qin J, Elledge SJ (November 1999). "Requirement of ATM-dependent phosphorylation of brca1 in the DNA damage response to double-strand breaks". Science. 286 (5442): 1162–6. doi:10.1126/science.286.5442.1162. PMID 10550055. ↑ Tibbetts RS, Cortez D, Brumbaugh KM, Scully R, Livingston D, Elledge SJ, Abraham RT (Dec 2000). "Functional interactions between BRCA1 and the checkpoint kinase ATR during genotoxic stress". Genes Dev. 14 (23): 2989–3002. doi:10.1101/gad.851000. PMC 317107 . PMID 11114888. ↑ Gatei M, Zhou BB, Hobson K, Scott S, Young D, Khanna KK (May 2001). "Ataxia telangiectasia mutated (ATM) kinase and ATM and Rad3 related kinase mediate phosphorylation of Brca1 at distinct and overlapping sites. In vivo assessment using phospho-specific antibodies". J. Biol. Chem. 276 (20): 17276–80. doi:10.1074/jbc.M011681200. PMID 11278964. ↑ Beamish H, Kedar P, Kaneko H, Chen P, Fukao T, Peng C, Beresten S, Gueven N, Purdie D, Lees-Miller S, Ellis N, Kondo N, Lavin MF (August 2002). "Functional link between BLM defective in Bloom's syndrome and the ataxia-telangiectasia-mutated protein, ATM". J. Biol. Chem. 277 (34): 30515–23. doi:10.1074/jbc.M203801200. PMID 12034743. ↑ Suzuki K, Kodama S, Watanabe M (September 1999). "Recruitment of ATM protein to double strand DNA irradiated with ionizing radiation". J. Biol. Chem. 274 (36): 25571–5. doi:10.1074/jbc.274.36.25571. PMID 10464290. ↑ Taniguchi T, Garcia-Higuera I, Xu B, Andreassen PR, Gregory RC, Kim ST, Lane WS, Kastan MB, D'Andrea AD (May 2002). "Convergence of the fanconi anemia and ataxia telangiectasia signaling pathways". Cell. 109 (4): 459–72. doi:10.1016/s0092-8674(02)00747-x. PMID 12086603. ↑ Kang J, Ferguson D, Song H, Bassing C, Eckersdorff M, Alt FW, Xu Y (January 2005). "Functional interaction of H2AX, NBS1, and p53 in ATM-dependent DNA damage responses and tumor suppression". Mol. Cell. Biol. 25 (2): 661–70. doi:10.1128/MCB.25.2.661-670.2005. PMC 543410 . PMID 15632067. ↑ Fabbro M, Savage K, Hobson K, Deans AJ, Powell SN, McArthur GA, Khanna KK (July 2004). "BRCA1-BARD1 complexes are required for p53Ser-15 phosphorylation and a G1/S arrest following ionizing radiation-induced DNA damage". J. Biol. Chem. 279 (30): 31251–8. doi:10.1074/jbc.M405372200. PMID 15159397. ↑ Khanna KK, Keating KE, Kozlov S, Scott S, Gatei M, Hobson K, Taya Y, Gabrielli B, Chan D, Lees-Miller SP, Lavin MF (Dec 1998). "ATM associates with and phosphorylates p53: mapping the region of interaction". Nat. Genet. 20 (4): 398–400. doi:10.1038/3882. PMID 9843217. ↑ Westphal CH, Schmaltz C, Rowan S, Elson A, Fisher DE, Leder P (May 1997). "Genetic interactions between atm and p53 influence cellular proliferation and irradiation-induced cell cycle checkpoints". Cancer Res. 57 (9): 1664–7. PMID 9135004. ↑ Bao S, Tibbetts RS, Brumbaugh KM, Fang Y, Richardson DA, Ali A, Chen SM, Abraham RT, Wang XF (June 2001). "ATR/ATM-mediated phosphorylation of human Rad17 is required for genotoxic stress responses". Nature. 411 (6840): 969–74. doi:10.1038/35082110. PMID 11418864. ↑ Li S, Ting NS, Zheng L, Chen PL, Ziv Y, Shiloh Y, Lee EY, Lee WH (July 2000). "Functional link of BRCA1 and ataxia telangiectasia gene product in DNA damage response". Nature. 406 (6792): 210–5. doi:10.1038/35018134. PMID 10910365. ↑ Long X, Lin Y, Ortiz-Vega S, Yonezawa K, Avruch J (April 2005). "Rheb binds and regulates the mTOR kinase". Curr. Biol. 15 (8): 702–13. doi:10.1016/j.cub.2005.02.053. PMID 15854902. ↑ Chang L, Zhou B, Hu S, Guo R, Liu X, Jones SN, Yen Y (November 2008). "ATM-mediated serine 72 phosphorylation stabilizes ribonucleotide reductase small subunit p53R2 protein against MDM2 to DNA damage". Proc. Natl. Acad. Sci. U.S.A. 105 (47): 18519–24. doi:10.1073/pnas.0803313105. PMC 2587585 . PMID 19015526. ↑ Kim ST, Xu B, Kastan MB (March 2002). "Involvement of the cohesin protein, Smc1, in Atm-dependent and independent responses to DNA damage". Genes Dev. 16 (5): 560–70. doi:10.1101/gad.970602. PMC 155347 . PMID 11877376. ↑ Fernandez-Capetillo O, Chen HT, Celeste A, Ward I, Romanienko PJ, Morales JC, Naka K, Xia Z, Camerini-Otero RD, Motoyama N, Carpenter PB, Bonner WM, Chen J, Nussenzweig A (Dec 2002). "DNA damage-induced G2-M checkpoint activation by histone H2AX and 53BP1". Nat. Cell Biol. 4 (12): 993–7. doi:10.1038/ncb884. PMID 12447390. ↑ Ward IM, Minn K, Jorda KG, Chen J (May 2003). "Accumulation of checkpoint protein 53BP1 at DNA breaks involves its binding to phosphorylated histone H2AX". J. Biol. Chem. 278 (22): 19579–82. doi:10.1074/jbc.C300117200. PMID 12697768.